They are best known for their 1994 cover of The Troggs' 1960s hit "Love Is All Around", which was used on the soundtrack to the film Four Weddings and a Funeral. It was a huge international success and spent 15 weeks atop the British charts. One week before potentially equalling the record for the most consecutive weeks at number 1 on the UK singles chart, held by Bryan Adams' "(Everything I Do) I Do It for You", it dropped to number two. 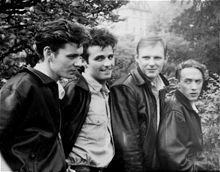 The quartet formed at Clydebank High School in Clydebank, Scotland, in 1982, under the name "Vortex Motion", mostly playing covers of The Clash and Magazine. "It was either crime, the dole, football, or music — and we chose music," said Tommy Cunningham. The original line-up consisted of: Neil Mitchell (keyboards), Tommy Cunningham (drums), Graeme Clark (bass), Mark McLachlan (a.k.a. Marti Pellow) vocals and original guitarist Lindsey McCauley. Clark and Cunningham met on the school bus and became close friends. Mutual friend Neil Mitchell, prompted by his pals' positive attitude, promised to supply keyboards when he could scrape together enough money from his paper round. To complete the quartet, Clark approached Mark McLachlan, who at the time was training to be a painter and decorator. He said, "At break we all went behind the kitchen for a fly smoke, and there in the corner was this quiet kid who said very little, but when he sang, everyone listened." It was sometime in 1983 that Graeme Duffin joined Wet Wet Wet, after the departure of co-founder Lindsey McCauley. Duffin had previously been in a Glasgow-based band called New Celeste and recorded two albums with them High Sands and the Liquid Lake (1977) in Holland (with sleeve notes by Billy Connolly) on the Universe label and On the Line (1979) in Berlin on the Hansa Records label. The band combined folk, rock and jazz players. "At the time it was Duran Duran, Talk Talk – double-barrelled names; we just added on another to confuse people. And we would look outside and see the rain coming down. It did seem quite relevant to Glasgow." With the line-up complete, rehearsals took place in Mrs. Clark's kitchen. They rehearsed for about two years, working on song producing and writing skills. They eventually made their live debut at Glasgow's Nightmoves venue. At this gig they met Elliot Davis, who would become the band's manager. The band name Wet Wet Wet was chosen from a line in the 1982 Scritti Politti song "Gettin' Havin' & Holdin'" ("it's tired of joking... wet, wet with tears"), and McLachlan changed his name to stage name "Marti Pellow". Their first professional gig was a New Year's Eve show at Glasgow's Barrowlands. David Bates signed the band to PolyGram in 1985. One of the first demo songs they did was "Wishing I Was Lucky". When the band took the demo to Bates in late 1986, he discarded it as a poor effort. The band decided at this point that they could no longer work with him. Six months later, the band and their new A&R Manager, Nick Angel, released the single, and it reached number six in the UK singles chart. "I was in a queue in a fish and chip shop in Glasgow when it came on Radio Clyde," Cunningham remembers. "I felt like shouting to everybody, 'That's me and my mates!' It was an incredible feeling I've not forgotten." The parent album, Popped In Souled Out, also became a hit and produced three more hit singles, namely "Sweet Little Mystery", "Temptation", and "Angel Eyes". They supported Lionel Richie on his UK tour. In 1988, Wet Wet Wet scored their first Number 1 hit with a cover version of the Beatles' "With a Little Help from My Friends", recorded for the charity ChildLine. Another Beatles song, "She's Leaving Home", was equally-billed on the flip side, performed by Billy Bragg. In the same year, an album - entitled The Memphis Sessions - was released from their spell in the United States prior to hitting the big time. It was produced and mixed by Willie Mitchell. It was recorded at his Royal Studios in Memphis, Tennessee. The following year the band released their third album, Holding Back the River, which was also a success and produced the hit single "Sweet Surrender". The album was well-received, relying more on strings and other classical arrangements. At the end of 1989, the band appeared on the Band Aid II charity single. In 1992, the band released a fourth studio album, entitled High on the Happy Side, which spawned the Number 1 hit single "Goodnight Girl" - the only self-penned chart-topping single they have had to date. The song proved something of a saviour, as the previous two single releases from the album had failed in the singles charts, although the album sold well. In total, five singles were released from it. The following day saw the release of a special-edition album, Cloak & Dagger, released under the alias "Maggie Pie & The Impostors". "Maggie Pie" was Marti Pellow, and the "impostors" were (on album cover, clockwise from top left) Neil Mitchell, Graeme Duffin, Tommy Cunningham, and Graeme Clark. The band's first greatest-hits package, End of Part One, was released towards the end of 1993. The eighteen-song selection included "Shed a Tear" and "Cold Cold Heart", which were recorded with Nile Rodgers in New York City especially for the album and released as singles. In 1994, Wet Wet Wet had their biggest hit, a cover version of The Troggs' single "Love Is All Around", which was used on the soundtrack to the film Four Weddings and a Funeral. It was a huge international success and spent 15 weeks atop the British charts. The week before it could have equalled the record for the longest-standing number-one single, held by Bryan Adams' "(Everything I Do) I Do It for You", Pellow insisted on its deletion because he wanted to focus on getting their next album, Picture This, finished. However, even after its deletion, there were still enough copies in the shops to get the song to number 2 in its 16th week, finally knocked off the top spot by Whigfield's debut single "Saturday Night". In any event, it remained in the Top 40 for the remainder of the year. In the official UK best-selling singles list issued in 2002, it was placed 12th. "Love Is All Around" also featured on the 1995 album Picture This, their sixth, which also spawned the hit single "Julia Says" and "Don't Want to Forgive Me Now". The album, although well received by critics, would ultimately live in the shadow of "Love Is All Around". During the rest of the 1990s the band maintained a strong UK following, although success in the singles charts became more sporadic. Their seventh studio album, 1997's Ten, celebrated the group's decade at the top. After the tour in support of 10, things turned sour over a dispute about royalty-sharing. Revenue from the group's songwriting had been a four-way equal split. Cunningham turned up for a routine band meeting, only to discover that the other three members wanted to revise the policy, paying the drummer a lesser amount. Cunningham instantly quit the group saying that the band had run its course and that the band was no longer a healthy place to be. In 1999 Pellow also quit the band, to focus on getting himself healthy again after succumbing to a debilitating alcohol and drug addiction. Pellow succeeded in kicking his habits, and returned to the public eye in 2001 with his debut solo album, Smile. In March 2004, the band cautiously reformed in order to work on an eighth album. A single entitled "All I Want" was released in November 2004 from the band's second Greatest Hits, released a week later. They undertook a successful tour of the UK the following month. In July 2005, Wet Wet Wet played at the Summer Weekender festival in England, and were one of the headline acts at Live 8 Edinburgh in Scotland. On 31 December 2006, Wet Wet Wet were the headline act for Aberdeen's Hogmanay celebrations when the celebrations in all other Scottish cities was held off because of strong winds and heavy rain. They performed thirteen songs in an hour-long set. A single, "Too Many People", was released on 5 November 2007, and its parent album, Timeless, on 12 November. These preceded a sold-out December tour, a taste of which was given at their Newmarket concert in August. In preparation for the tour, the band also announced that they will be playing two intimate dates at zavvi stores in Glasgow and London in November. "Weightless", the second single from the album, was released on 4 February and charted at Number 10, giving them their first top-ten hit in eleven years. In March 2012, it was announced that the band would perform its first concert in over five years, at Glasgow Green on 20 July, to celebrate their 25th anniversary of the release of their debut album, Popped In, Souled Out. In May 2013, UK music promoter Stuart Galbraith of Kilimanjaro Live confirmed a ten date UK tour for Wet Wet Wet commencing in December 2013. On 8 October 2013, Wet Wet Wet announced via their Twitter page that they would be releasing a new Greatest Hits album, Step by Step: The Greatest Hits, on 25 November 2013. The album features three new tracks as well as songs from their back catalogue. On 28 July 2017, it was announced that Pellow had quit Wet Wet Wet to focus on his solo career. On 25 September 2018, the band announced that Kevin Simm (from Liberty X) was their new singer. Simm started singing with the band at two shows: St Lukes in Calton, Glasgow, and 229 The Venue in London in November 2018. Following on from their sold out shows, they announced a nationwide 18-date tour, starting in April 2019. ^ "Wet Wet Wet: "We're all coming up to 50 now and no-one's died!"". Cambridge News. 31 July 2014. Retrieved 27 August 2014. ^ "Wet Wet Wet tweet their thanks to Carlisle". ITV News. 5 August 2014. Retrieved 27 August 2014. ^ Larkin, Colin, ed. (2006). "Wet Wet Wet". Encyclopedia of Popular Music (4th ed.). Oxford University Press. ISBN 978-0-19-531373-4. ^ Mawer, Sharon. "Wet Wet Wet – Popped in Souled Out". AllMusic. All Media Network. Retrieved 27 April 2016. ^ "Graeme Duffin". Monique van Spellen. Archived from the original on 14 June 2008. Retrieved 27 May 2008. ^ a b Snow, Mat (14 March 1987). "I can't stand the rain". NME. London, England: IPC Media: 21–22. ^ "Chippie made me a super star". Sunday Mail. Retrieved 29 December 2006. ^ Lindsay, Clive (15 July 2002). "Well dries for the Bankies". BBC Sport. Retrieved 29 December 2006. ^ "Pellow quits Wet Wet Wet". BBC News. 11 May 1999. Retrieved 15 January 2007. ^ "Fire ceremony marks start of 2007". BBC Online. 1 January 2007. Retrieved 2 January 2007. ^ Lyons, Beverley (9 November 2007). "Wets To Play Intimate Gig". Daily Record. Glasgow. Retrieved 14 February 2015. ^ Clarke, Emily (28 July 2017). "Marti Pellow announces Wet Wet Wet departure". Edinburgh Evening News. Retrieved 28 July 2017. ^ Binding, Lucia (25 September 2018). "Wet Wet Wet announce Liberty X star Kevin Simm as new frontman". Sky News. Retrieved 10 February 2019. ^ Kitchener, Shaun (25 September 2018). "Wet Wet Wet announce comeback WITHOUT Marti Pellow: Guess who's replaced him?". Express.co.uk. Retrieved 10 February 2019. ^ Cooper, Louise (4 December 2018). "Wet Wet Wet coming to Buxton Opera House in 2019". www.buxtonadvertiser.co.uk. Retrieved 10 February 2019.